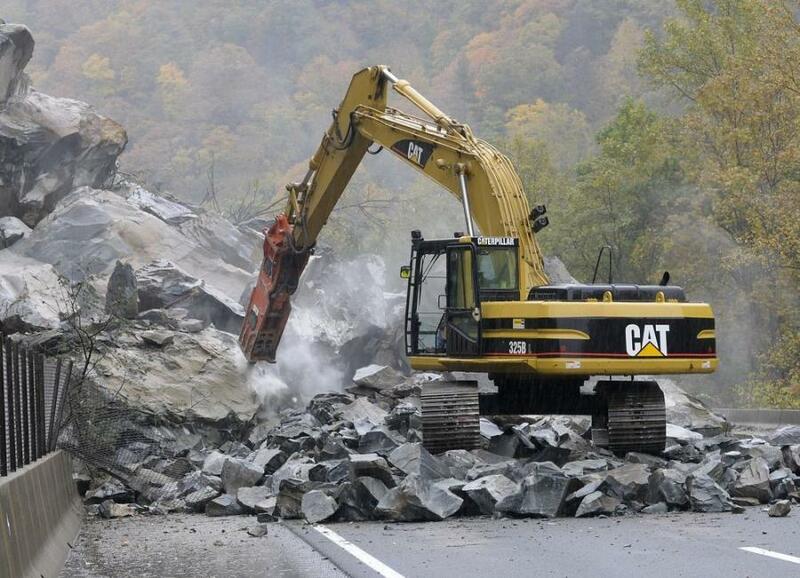 The North Carolina Department of Transportation (NCDOT) called out heavy equipment to clean up a rockslide that occurred along Interstate 40 near the Tennessee state line in Haywood County. Westbound lanes were closed at the highway U.S. 276 exit and eastbound lanes were closed at the Harmon Den exit. A detour was in place as crews worked to stabilize the hillside. 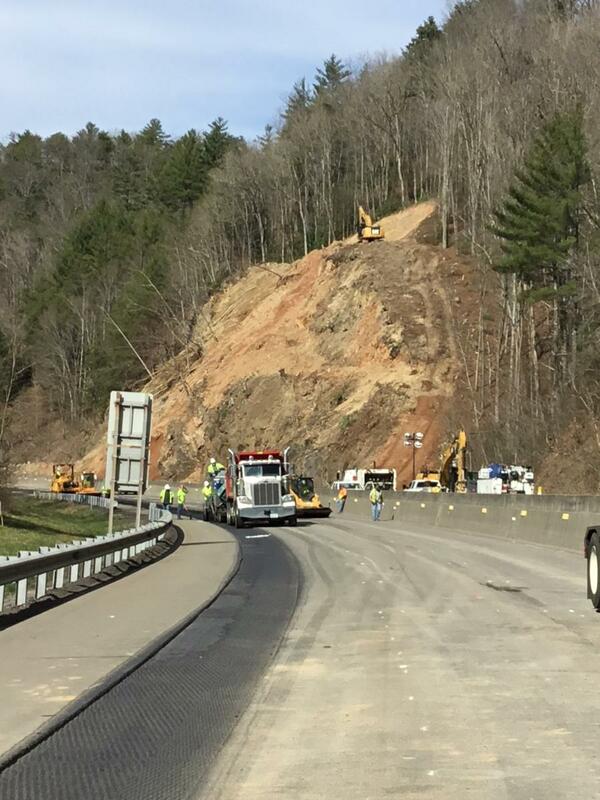 Nathan Tanner, District 2 resident engineer of NCDOT, reported that the slide occurred around 7:30 p.m. Feb. 22 when enough debris to fill two dump trucks came down on the outside of I-40 West. It was reported that heavy, sustained rainfall was a contributing factor to the slide. "Sometime in the 1990s, material at the top of the slope settled and never came off," Tanner said. "Our geotechnical engineers have been monitoring it for some time." After the slide, engineers were brought in to assess the 100-ft. slope so that no more debris would come down. "All of the material on a 15-foot vertical cut on the edge of I-40 is rock," Tanner explained. "Above that, it is all soil and trees. Material broke loose and soil fell into the roadway." The geotechnical engineers determined they needed to remove all of the material and lay it back on a 1-1/2:1 slope, he said. An emergency contract for the project was awarded to Harrison Construction at a cost of $2.1 million. "We are focusing on how to remove the material, and once it is removed, we can get the major route back open by switching traffic into the eastbound lanes — one in each direction on I-40 at MM 7," Tanner said. Crews removed the median rail and installed a portable concrete barrier to stop traffic and guide it through the shift. "We are pushing the dirt from the slope down to the roadway and hauling it to a waste site," he said. "We hope to have the traffic shift completed by the end of the week. Then we will be removing the median and stabilizing the slope all the way up until April 1." Tanner explained that to complete the job while traffic continued to run, a positive protection against the median wall was built so no material could fall and bounce into the lane. Conex boxes were placed at the top of the berm area so any debris from the top would not bounce and go over the barrier. "Once the material is removed and we stabilize the slope, we will install anchors and wire mesh at the top to slow debris and drill horizontal drains so the water will leach out," Tanner said. 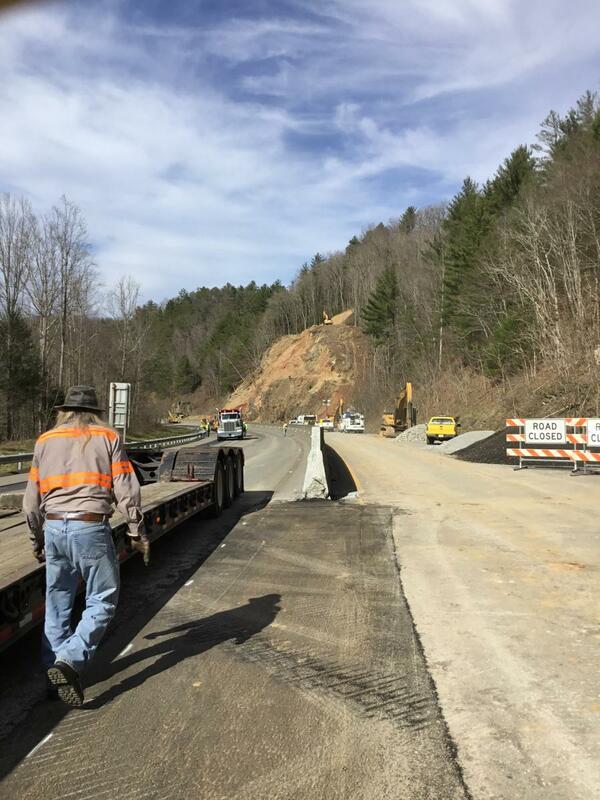 News reports stated that NCDOT crews also were taking advantage of the road closure to perform other maintenance tasks along I-40, such as repairing bridge joints, patching potholes and clearing ditches. I-40 was reopened to one lane of traffic heading in each direction at mile marker 7.5 Feb. 28, NCDOT announced in a press release. Eastbound traffic from Tennessee was being funneled into one lane before the Harmon Den exit. Westbound traffic began merging lanes shortly after the rest area. NCDOT said traffic would remain in this pattern through the Pigeon River Gorge for about five weeks. Motorists driving through the area were told to expect delays, especially during peak hours. The speed limit has been lowered to 45 MPH until the repairs are complete. "We know this is an important route for more than Haywood County, western North Carolina and east Tennessee residents," Tanner said. "It's important to everybody crossing through the Smoky Mountains." The narrow stretch of I-40 through the Pigeon Gorge was completed in 1968 and involved cutting a 20-mi. section through steep, rocky terrain. The project reportedly took nearly 20 years. Since then, the area has been plagued by rock slides, which have kept alive the original controversy over the location of the interstate and costing far more than the road's initial construction. The first slide occurred in February 1969, just six months after the route opened. Subsequent slides closed the highway at least seven times though the subsequent decades. Since the roadway opened, two people have been killed as a result of falling rocks, and another three died in a collision at a landslide detour near the Fines Creek exit, according to previous published new reports. A major slide in 1978 caused a wreck in which seven people were injured, and the cost of the cleanup following a 2009 slide was estimated at more than $10 million. Another major slide, in March 1985, blocked the entrances to a tunnel, requiring about $6 million in repairs and taking nearly a year to clean up. NCDOT has tried repeatedly over the years to stabilize the slide areas.